Finance’s giants are poised to move into online lending. Can the disruptors keep up? The patriots then readied themselves for the impending attack, and the battles of Lexington and Concord became the opening acts of an epic and tragic struggle. The rebel forces of the online lending industry have, over the past decade, settled land that was either untouched or had been abandoned by the traditional world of financial services. They are now flourishing, having opened up access to credit for vast swathes of small businesses and consumers. Many of these new-age lenders – such as Lending Club, Prosper and Funding Circle – operate marketplace models, and as such provide value to investors, as well as to borrowers. The successes of these online lenders have led to hundreds of billions of dollars in lending globally, dizzying monthly growth rates in volumes, and a pair of high profile IPOs. But that success has not gone unnoticed. Forces from the more dynamic end of the “old world” are beginning to stir. For nigh on a year, rumours have swirled around several institutions that are understood to be sizing up an entry into the online lending space. Those names include Goldman Sachs, Blackstone and Hargreaves Lansdown – each a powerhouse within its own respective field. Goldman is perhaps the world’s pre-eminent investment bank. Blackstone is the world’s largest private equity firm. Hargreaves holds in excess of £50bn in client assets, and is the UK’s leading provider of pensions and savings products. What we know is that each of these megaliths is incubating a platform of some description. How each offering will ultimately look, and indeed how much we know about each platform, varies considerably. Much of what we know about the Goldman outfit has been gleaned from the company’s strategic hires. The new lending business will be headed up by Harit Talwar, who was on-boarded in early May. Mr. Talwar left his job as Head of Card Services at Discover Financial in order to lead Goldman’s charge into the online lending space. He was instantly made a partner in the firm (one of around 400), a move which clearly reflects the importance of his remit. The New York Times reported then that the new lending operation might boast as many as 100 employees by the end of the year. In late October, Reuters confirmed that Goldman was on the hunt for a fresh crop of engineers, data scientists, operations staff and customer service professionals. We also learnt that the Wall Street bank had poached former Lending Club executive Darin Cline to lead operations at the new venture. From a practical standpoint, what we know about the fledgling operation is that its lending will be financed directly through Goldman’s New York State-chartered banking subsidiary, which was birthed in the wake of the 2008 financial crisis, when Goldman became a bank-holding company. To date this arm of the company has mostly written loans to private clients and institutions. The size of the average Goldman loan will likely be around $15k-$20k. The New York Times stated that the company is considering issuing borrowers with “a sort of prepaid card”, from which money may be drawn down for purchases. In terms of an arrival date, early 2016 has been banded around in the press. Goldman made an effort to elucidate the scale of the online lending opportunity in March, just a few months before hiring Mr. Talwar. The company produced a research note which estimated that of the $150bn in profit earned by US banks in 2014, $11bn could be captured by non-bank lenders over the next half-decade. In other words, the very success of the existing wave of online disruptors was enough to convince Goldman to enter into the fray. Blackstone has also taken notice. A few weeks ago, we learnt that B2R Holdings, a portfolio company of a Blackstone Group LP fund, had arrived in the online lending arena – following a rebrand to “Lending.com”. Just imagine what the domain name alone would have cost! Peter Rudegeair of the Wall Street Journal reports that the new company will provide loans for consumer purchases of big-ticket items, as well as small business loans. 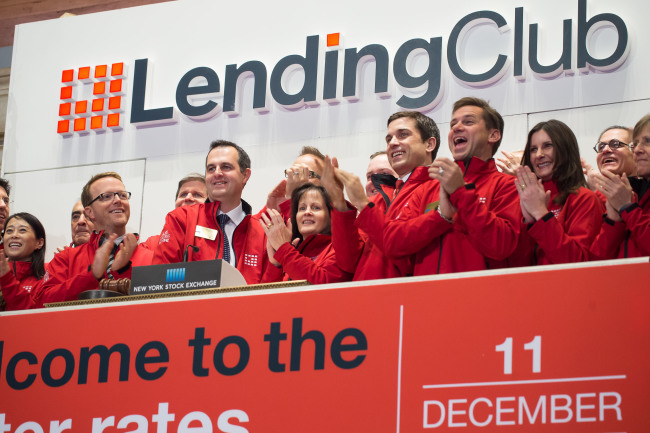 Lending.com Founders Jason Hogg and Nick Gould hope to hit $10 billion in lending within the next 3 years, a feat which only one Western online lender (Lending Club) has to date accomplished. The second core advantage for Lending.com is its ties to Blackstone, which Hogg believes will allow for the implementation of a more efficient institutional sales programme. He told the Wall Street Journal in October that the majority of online lenders are “yet to master” the capital markets side of running a lending platform. Hargreaves Lansdown has been circling for longer than both of the above companies. Head of Financial Planning Danny Cox suggested that the company was in a “fact-finding” phase way back in December 2014. Unofficial confirmation that Hargreaves would construct a platform came in February 2015, when Chief Executive Ian Gorham lauded his company’s capacity for bringing scale to the sector. Hargreaves, unlike Goldman and Lending.com, will launch a peer-to-peer lending offering, drawing upon a vast community of individual investors. Hargreaves issued an update in September, again highlighting its large asset base as a pivotal USP for its peer-to-peer offering. A statement from the company suggested that this luxury will also help the P2P offering to effectively price risk, which would suggest that Hargreaves customers will also be able to directly borrow from the platform. This sleeping giant is expected to awaken around Autumn 2016, giving the existing disruptors plenty of time to prepare themselves. 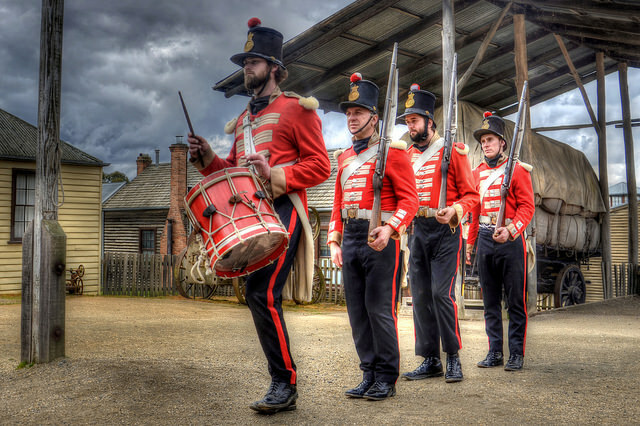 Although it doesn’t quite fit with the Redcoats metaphor, it’s worth noting also that megalithic technology companies pose perhaps as great a threat to the first wave of online lenders. PayPal Working Capital has managed to lend over $1 billion to over 60,000 small businesses in the UK, US and Australia since launching in May 2014. Basware Commerce Network – the world’s largest open business network for e-invoicing – has just rolled out a new factoring solution in partnership with the UK based asset manager Arrowgrass Capital. A dizzying 100 million invoices, with a combined worth of over $500 billion, have been processed by the network to date. Note that the online titans that are Google and Facebook have also made appearances in AltFi News in the past, although there’s been no talk of them entering into the world of lending (…yet). So what does all this mean for the comparatively fledgling brands that currently dominate the online lending space? Will they heed the warning of a frantic Paul Revere and equip themselves for a protracted struggle? And if they do, can they hope to compete? Or are they largely unperturbed by the movements of the Goldmans and Blackstones of the world? There’s a line of thinking which suggests that it is somewhat naïve of even the most storied of institutions to assume themselves capable of taking over an industry that emerged in part due to widespread consumer disillusionment with the existing status quo. The banks in particular have borne the brunt of a tide swell of public ill will. Part of the charm of peer-to-peer lending is that it returns power to the hands of the consumer. The platforms are also highly transparent, and this applies also to many of the direct lending models – in terms of the way that borrower fees and repayments are handled. Is a trendy exterior (Lending.com, for instance) and a deep pool of resources really all that it takes to topple the upstarts? Or have we seen a more profound change take hold over the past decade? 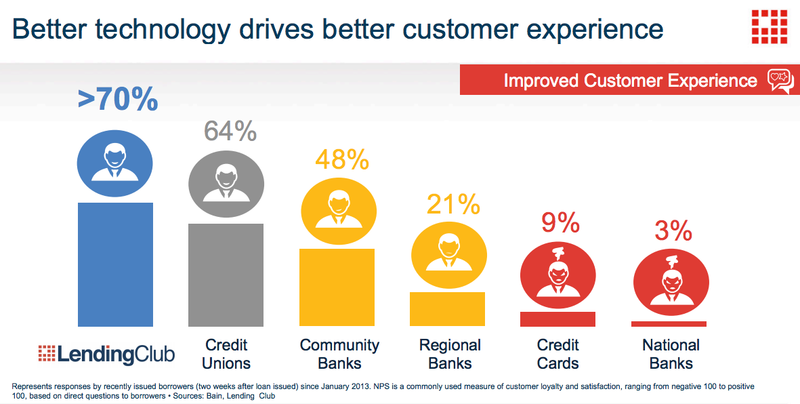 In his annual signature keynote at LendIt USA, Sanborn’s colleague Renaud Laplanche returns time and time again to the lofty Net Promoter Scores that customers typically attach to the Lending Club experience. As the slide below shows, the banks pale by comparison in this field. I suppose what we’re really asking here is simple: are existing online lending models sustainable, and will they hold up even in the face of far fiercer competition? I suspect that more than a few platforms would beg to differ.